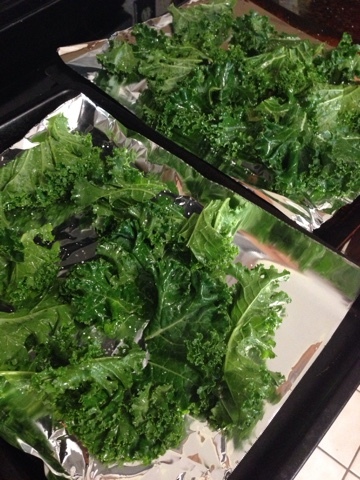 Kale is amazing. 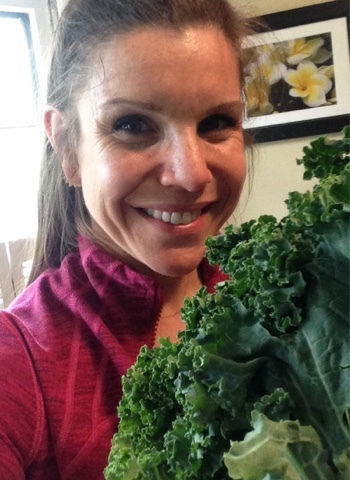 One cup of kale has just 36 calories, a whopping 5 grams of fiber, and 15% of the daily requirement of calcium and vitamin B6, 40% of magnesium, 180% of vitamin A, 200% of vitamin C, and 1,020% of vitamin K. Seriously, if you aren't eating it, why?!? Bunch of kale with huge leaves...from your local farmers' market perhaps!? 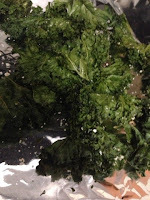 Tear leafy part of kale away from thick stem in the middle and break into "chip-size" pieces (like 2 in. by 2 in. or bigger or smaller to your liking...the pieces will shrink as they bake). It's super easy just to cut along the stem to get the leaves off. It's hard getting good and REAL food on the table sometimes but I have a super easy solution that covers your veggie and protein needs in 30 minutes flat. I like making my own stuff, but sometimes you just need to buy your food already chopped and such. 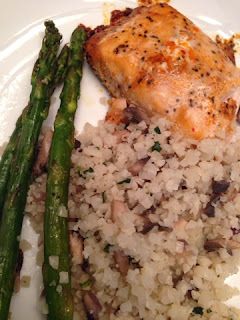 I have been buying the wild Alaskan salmon fillets from Costco (6 oz portions)...they are delicious! Just pop however many you need to feed yourself or your family in the oven on a baking sheet lined with foil (for easy clean up) at 375 for 28 minutes. At the same time, put a bunch of asparagus on another cookie sheet (again....lined for easy clean up) and drizzle with olive oil, salt and pepper and bake it with the fish. While all of that is going on, put some frozen or fresh cauliflower rice* in a sauce pan with some other veggies like mushrooms, spinach and onions (keep some in the fridge from the grocery store salad bar...it's all chopped and ready to go for you!). Stir that pile of veggies until heated through and spice with whatever you want. I use some garlic, kosher salt, pepper and oregano. Everything should be ready at the same time. Throw it all on a plate and DONE! *Cauliflower rice is just simply cauliflower in tiny pieces...resembling rice. You can find it in the frozen section at Trader Joe's and other grocery stores and sometimes they have it fresh in the lettuce section and some stores. OR you can just throw a head of cauliflower in your food processor and make it yourself! Sally squat challenge-a little warm up for your next run...you're welcome! 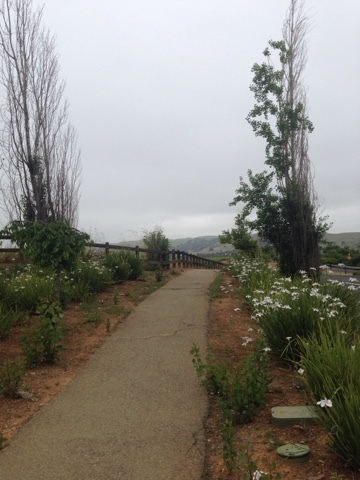 I decided on our last full day of vacation in wine country to warm up before mh run with a little, less-than-4-minute squat challenge to the song "Bring Up Sally" by Moby. It's super easy, when you here "down" you go down and hold a squat (with or without weights) until uou here "up" again. Wowzer...helloooooo glutes and quads. Then I went a few hilly miles with this spectacular view...I call it Running with the Vines...that will eventually become wine.